DREAM COME TRUE: I am starting 2013 at a new job where I get to reignite my geo-nerdery by indulging in mapmaking. I am in the midst of developing a series of interactive maps for various projects, assignments which required researching a number of online mapping applications and plug-ins. One of the main issues that kept cropping up was the proprietary aspect of some geodata, such as Google’s ‘ownership’ to user-created maps that are based on their source maps. OpenStreetMap (OSM) exists as an open-source alternative interactive map, a user-created and maintained wiki. I am surprised as I zoom in on Toronto’s downtown core in OSM and even street furniture has been plotted. It is an intensely detailed, layered universe of geo-data. This past weekend, an article was published on TalkingPointsMemo.com stating that OpenStreetMap just reached 1 million users, and that in two years time, it will rival GoogleMaps in comprehensiveness and quality. Maps are consumed at an ever increasingly rate in the age of search engines and smart phones. There are anthropological effects that come of this increasing dependency on a ‘Hit the Enter Button’ style of answer-seeking, with spatial-problem-solving proficiency on the decrease. To me, it’s similar to the consumption of fast fashion and freezer dinners – convenient solutions to everyday needs end up distancing us from understanding the processes of production. Much like other collaborative consumption projects, projects like OpenStreetMap close the gap between producers and consumers. By participating in the maintenance and enhancement of the OSM, you are collaborating in the creation of a global product to be shared. It is accessible, educational, practical, and social. How is it if you’re sitting behind a computer screen? Well, by knowing that the map is user-created by peers, there is a better idea of the humans behind the IP addresses and keyboards. A few days after I made my first edits on OSM, I received an email from the Toronto OSM Enthusiasts MeetUp group inviting me to their monthly Mappy Hour event. Mappy Hour is a monthly event put on by the Toronto OpenStreetMap Enthusiasts group on Meetup.com . Visit the group page for more details about future events. This month’s meet-up is TODAY – Monday, January 14, 2013 – starting at 6:30p.m. at C’est What (67 Front Street East). The bar is on the south side of Front Street, just east of Jarvis. 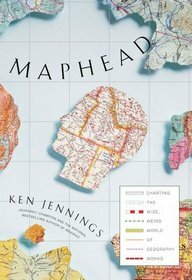 Over the holidays, I read Maphead by Ken Jennings (the Jeopardy super-champion), finding time to flip pages during subway rides and evenings in my parents’ home that was an Internet desert 80% of the time. The content was trivia-loaded – no surprise given Jenning’s background – with a lot of items that seemed, well, trivial; it felt like clicking through a geography wiki . That fact-density was paired with the occasional critical edge to discuss of how geography should be used as a tool for context-building (a study of systems and spatial influence) rather than simple data collection (even though maps and travel obsessions can encourage that simplified compulsive viewpoint). Nerdy private jokes show up on most pages – my mild hostility upon starting the book thawed as I became more engrossed in his storytelling. It is very characterful writing, a commitment to a personal colourful style that I respect. One of my favourite sections from the book is about OpenStreetMap being used as a tool for collecting global knowledge about Haiti’s built environment, used in the aftermath of the 2010 earthquake that toppled the country’s infrastructure (not to mention wreaking all kinds of other ruin). It is an exemplary historical moment of volunteerism, humanitarianism, pragmatism, and devotion. This Professional Geographer blog post by Jill Saligoe-Simmel, Ph.D. , provides more detail about the Haiti project run by Crisismappers and the OpenStreetMap community. Go have a read and restore your faith in maps! (In case it was faltering). If you are interested in reading more about cartographic discourse (don’t those words just make your heart beat a little faster), consider reading my paper, “Surrogates for reality: developing a dialogue with critical cartography and GIS”, published in Humanitas (Spring 2012), an interdisciplinary journal at the University of Toronto (available online).